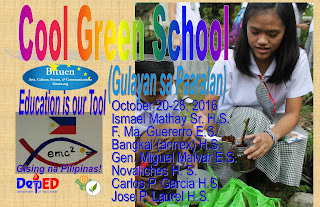 Metro Manila teachers and students from DepEd were presented with current sustainability trends and Metro Manila environment problems and opportunities in the Cool Green School (Gulayan sa Paaralan, National Greening Program) forum and workshop. The forum-workshop focused on current environment issues in Metro Manila: massive daily burning and dumping of wastes in waterways, pollution of land, air and water, threath in health and quality of life, and what is left for the "laylayan" members of the Philippine society: wastes, lacking or limited space, lack of access to resources, and lack of motivation and incentives. While teachers and students presneted issues and challenges in greening their environment, participants were shown how to make their own compost and organic soil from biodegradable wastes like scrap paper and packaging boards, kitchen refuse, and garden wastes, as well as utilize waste plastic and can containers as pots for planting seeds, seedlings, and cutting that they can harvest from. The presentation noted report of the Asian Deveopment Bank that there are at least 1.5 tons of garbage dumped daily in Metro Manila alone by the year 2015 as poverty remains unmitigated. 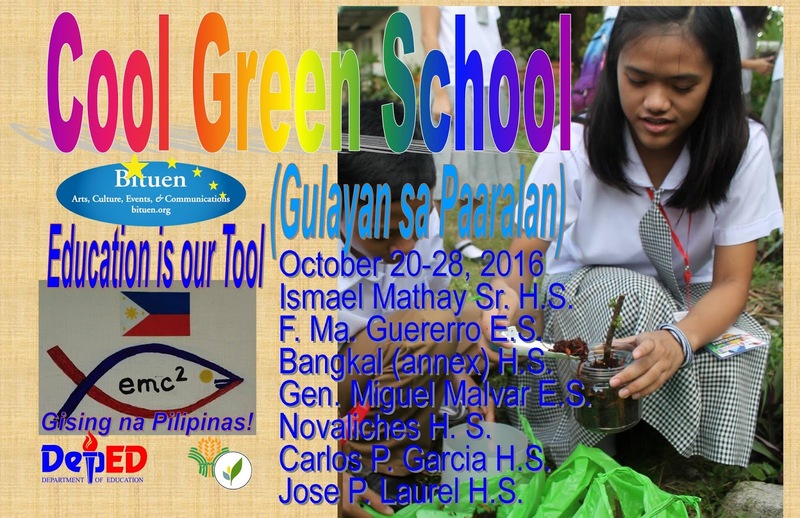 The workshop hopes to inspire widespread and integrated teaching and education on greening the learning environment through proper waste management and urban gardening. Public schools where urban poor were educated were taught how to reduce wastes at source but also to help improve air condition and reduce pollutions in their areas. It has been suggested that a learning environment with more plants and trees increases learning quality. The firts leg of the forum-workshop has been presented by Bituen Organization of volunteers supported by Education is Our Tool, 5 Loaves & 3 Fishes Miracle Project of Gising na Pilipinas!, DepEd, ToyKalapawMi, and the Bureau of Plant Industry.